Dylan Penn Photos, News, and Videos | Just Jared Jr.
Ava Phillippe dolls up for the Valentino presentation during Paris Fashion Week Womenswear on Sunday (March 4) in Paris, France. The 18-year-old model was joined in the front row by Dakota Fanning, Naomi Scott, Dylan Penn, Karlie Kloss, Anna Wintour, and Matilda Lutz. “thank you thank you thank you @maisonvalentino,” Ava shared on Instagram with a few heart emojis. Earlier in the week, Ava stepped out for the WELOVECOCO party held at the Chanel Beauty house in Los Angeles. Check out the pics if you missed them! Cara Delevingne & Dylan Penn Look Pretty at the Christian Dior Fashion Show in Paris! Cara Delevingne and Dylan Penn both look absolutely stunning! The two were both seen at the Christian Dior show during 2018 Paris Fashion Week on Tuesday (February 27) in Paris, France. Other stars at the event included Olga Kurylenko, Lottie Moss, Gabriella Wilde, Winnie Harlow, Isabelle Huppert, Olivia Palermo and Joannes Huebl. Cara posted a fun photo following the event on her Instagram. “Thank you for all my presents @dior ALL ABOARD 🚂🚂🚂,” she captioned the cute post. See below! 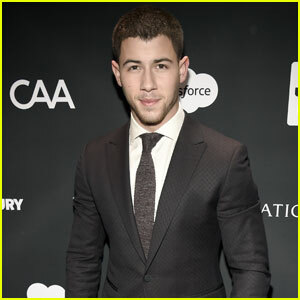 Nick Jonas cleans up really, really well. The 24-year-old singer and Kingdom star stepped out in a suit for the 2017 Sean Penn & Friends Haiti Rising Gala Benefiting J/P Haitian Relief Organization held at Montage Beverly Hills on Saturday evening (January 7) in Beverly Hills, Calif.
Sean‘s children Dylan and Hopper were also in attendance that night to support their father. A record $37 million was raised for J/P HRO and their initiatives in Haiti. Joe Jonas & Sophie Turner Have a Night Out at a Birthday Celebration! Joe Jonas and Sophie Turner coupled up for a fun night out with friends in LA! The duo stepped out together to attend CAA agent Cade Hudson‘s birthday party on Thursday night (January 5) and tons of other celebs showed up! Bella Thorne, Emma Roberts, Cody Simpson, Chord Overstreet, and Dylan and Hopper Penn all joined Joe and Sophie at the super fun 30th birthday bash. Other celebrities in attendance included Britney Spears, Kate Hudson, Paris Hilton and Seth MacFarlane! Jamie Campbell Bower suits up really sharp for the 2016 Hugo Boss Prize held at Solomon R. Guggenheim Museum on Thursday night (October 20) in New York City. The model and actor brought along his longtime girlfriend Matilda Lowther and was joined by Dylan Penn at the event, which honors visual artists, and comes with a $100,000 cash prize, as well as a solo exhibition at the Guggenheim Museum. Most of us know that Jamie starred as a Young Grindelwald in the Harry Potter movies, and with the prequel films coming up with Fantastic Beasts, we have to wonder if Jamie could return as the character! WHAT DO YOU THINK about Jamie returning as Grindelwald?